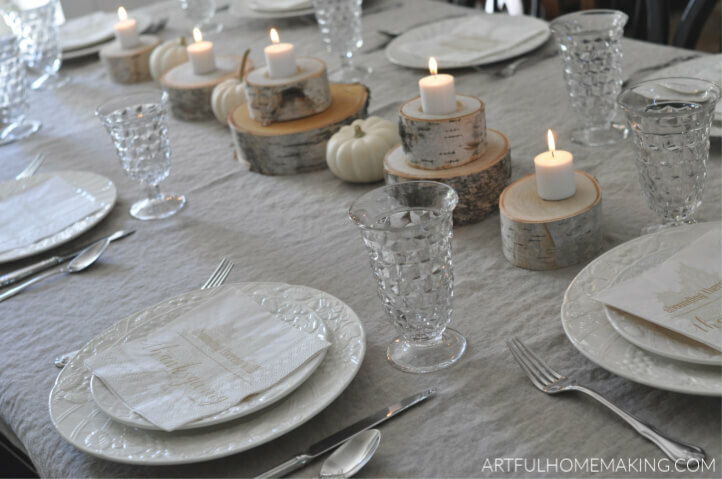 Rustic neutral fall tablescape with white pumpkins, linen and wood accents. 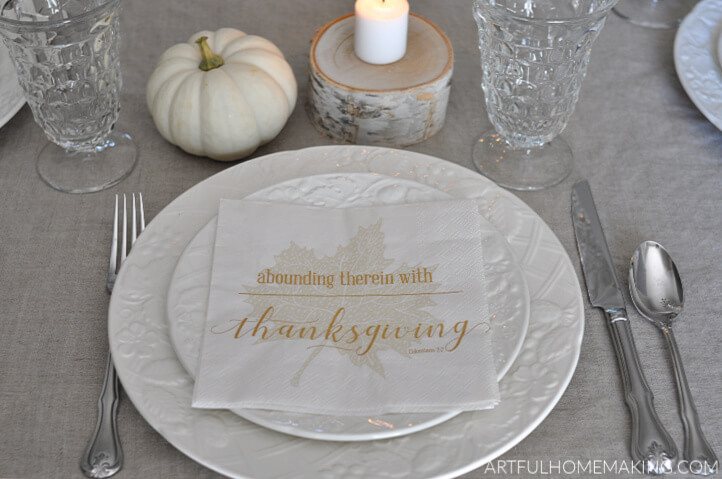 Decorate your table for fall with these simple ideas! 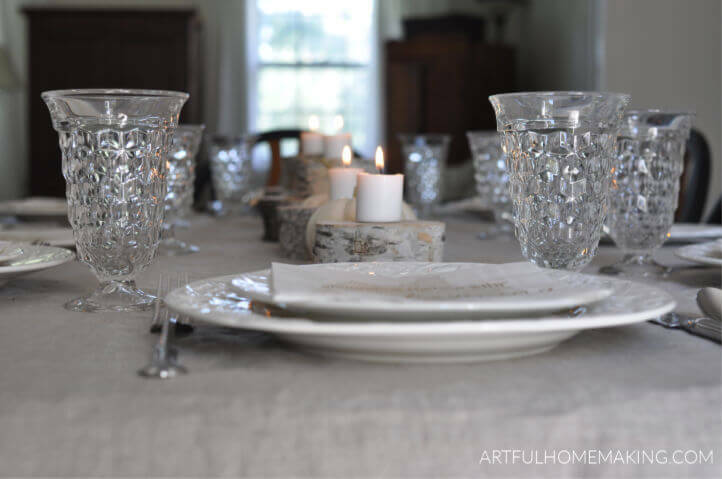 I love setting a beautiful table with special dishes, flowers, and candles. But for some reason, I don’t do it very often. 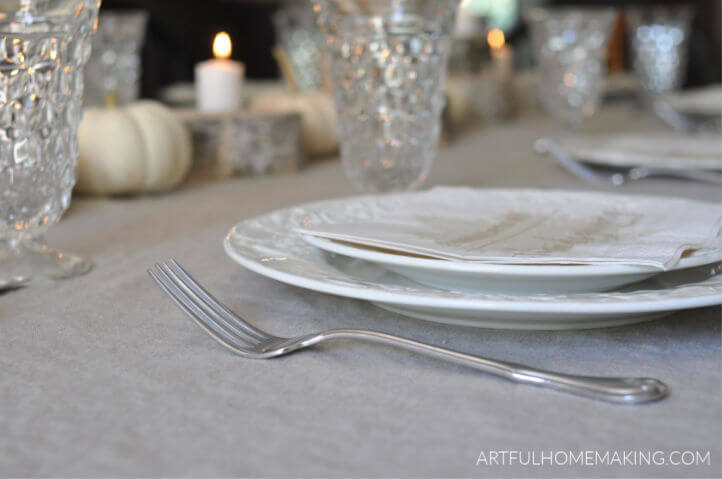 After setting this beautiful fall table with a linen tablecloth, the nice dishes, and candles, I was inspired. I’m planning to put more effort into our table decor from now on! Our dining table is set with the best dishes we have, which happen to be our wedding dishes. We registered for these beautiful, simple white dishes over twenty years ago. They’re still my favorite! The pattern is English Countryside, by Mikasa. I still love their simple beauty. The silverware and glassware were both gifts from my mom. I’ve always loved simple, classic decor. One of the things I love about it is that it never goes out of style! This simple, rustic neutral fall tablescape is so classic. The foundation of the table is a beautiful linen tablecloth. I love linen because of its timeless appeal that goes well with anything. 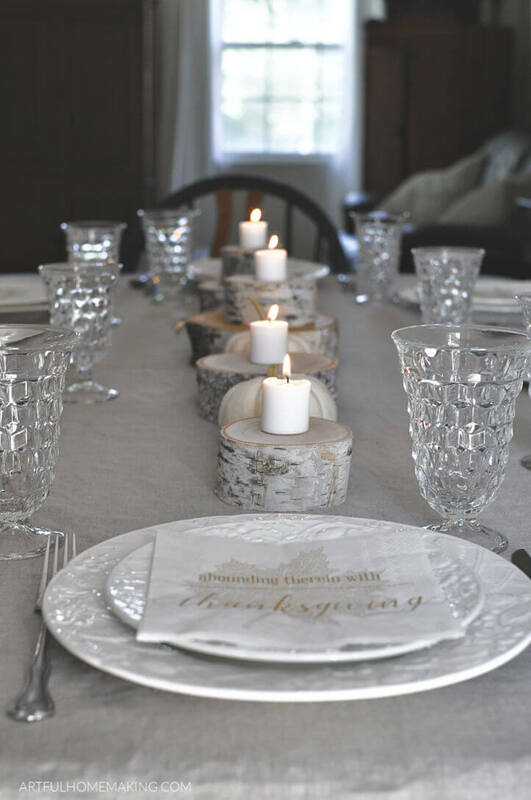 To the linen, I added white dishes, white pumpkins, white candles, and natural birch wood candle holders. 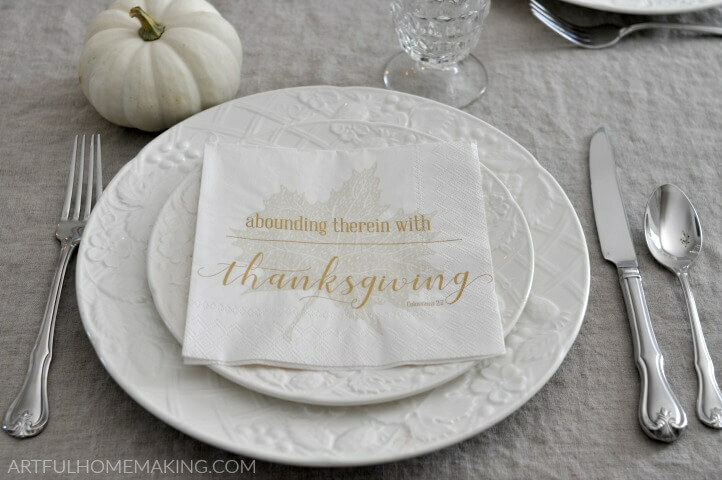 The crowning accent to my rustic neutral fall tablescape is the beautiful scripture napkins placed in the center of each plate. 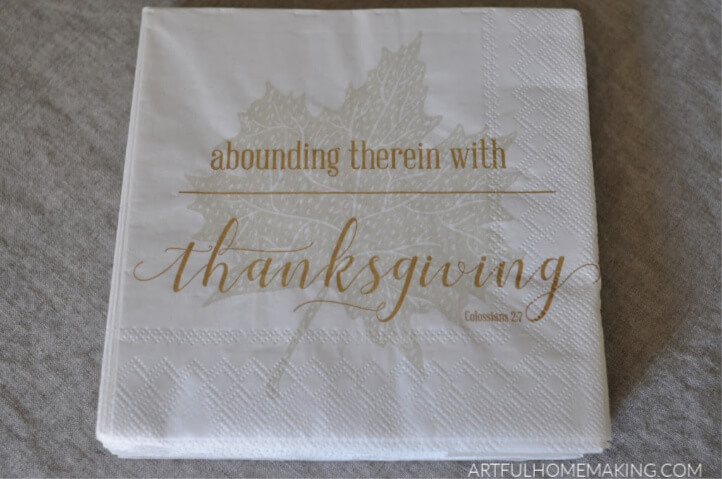 These Bible verse napkins would be perfect for your Thanksgiving table, but I think they’re wonderful for any occasion. It’s always nice to have a reminder to be thankful! I’ve shown them in a more formal dinner table setting, but they would also be great for weddings and Poetry Tea Time! While cloth napkins are beautiful and classic, sometimes paper napkins make so much more sense, especially when children are involved! Sara, from Pearls of Parchment, sent me these napkins to review, along with the handmade birch wood decor pieces. Aren’t they lovely? Be sure to check out the other scripture napkin designs available here. In addition to offering the Bible verse napkins on Amazon here and on Etsy, Pearls of Parchment would love to partner with you! Sara has kindly offered a coupon code for Artful Homemaking readers! 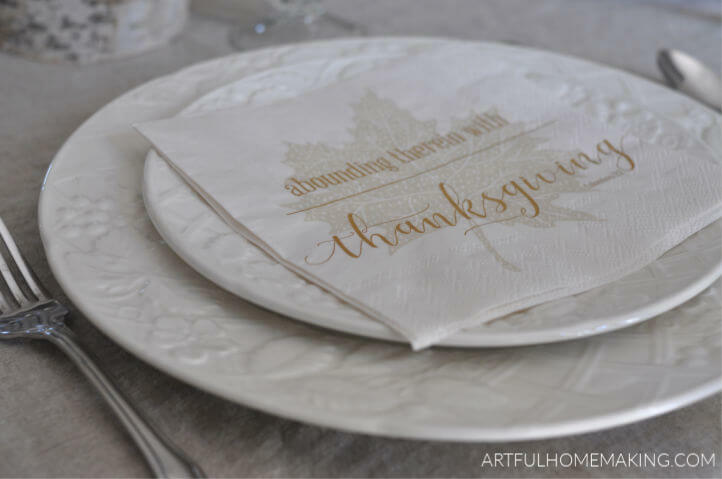 Today through October 5th, get 15% off on scripture napkins when you use the code ARTFUL15NAPKIN in Sara’s Etsy shop here. Also, you can get 10% off on any of the wood decor with the code ARTFUL10DECOR in Sara’s Etsy shop here. You can use both of these coupon codes together, so this is a great time to stock up! I do like the napkins, formal, classic, great. I hope Tuesday Morning had them in stock. That is a lovely fall table, we’re having guest stay for the next several days and you’ve given me some great ideas for setting a nice table. Thanks for sharing on the Homestead Blog Hop! Thank you, Lesa! Glad it was helpful, and enjoy your guests! Joy, I luv your table setting. 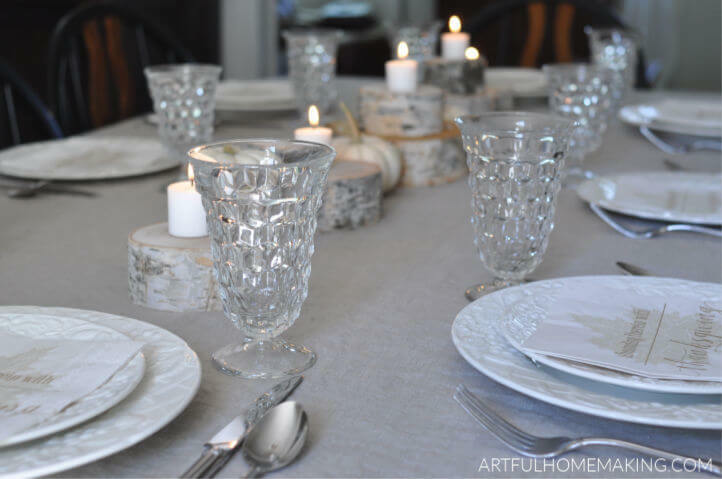 Those glasses with the birch candlesticks are perfect! I’m going to feature you tomorrow on Wall to Wall DIY Wednesday. Pinned! Thank you, Ann! And thanks so much for the feature! Thank you, Jennifer! 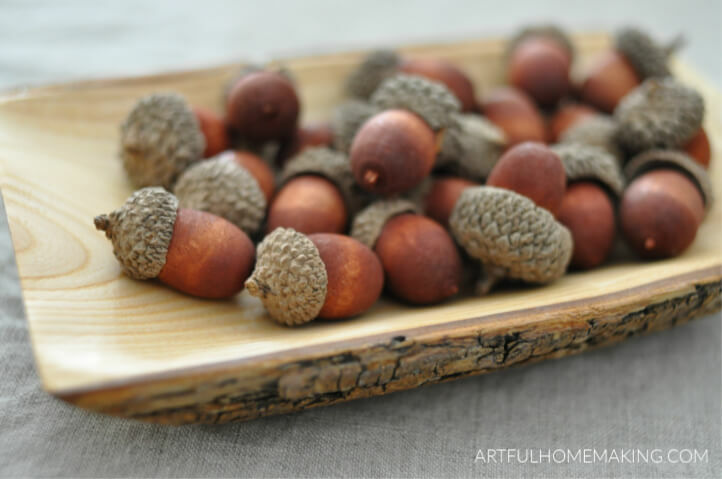 I know, I’m picturing them as perfect winter decor, too. So glad you stopped by! 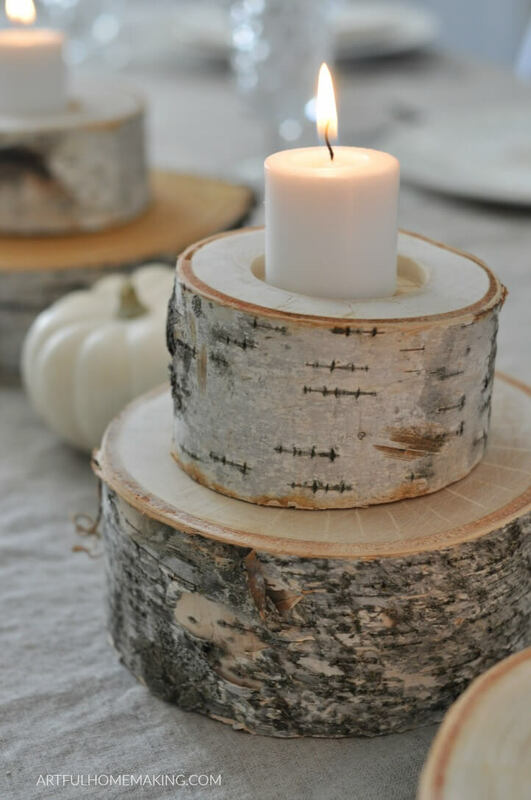 The birch candle holders are so pretty! I agree, they’re my favorite part, and I love that they were handmade! The table setting is so lovely.